The time has come that I pull up the venetian blinds, and let life, no matter how grey and rainy at times (figuratively and literally), back in. For the past couple months, I’ve been working behind the scenes, but I’ll get to that in a minute. And the work, I assure you has not been grey. It’s made life a little clearer for me. It’s made me learn more about who I am, where I want life to take me, and it’s taught me that at times, something’s got to give. I’ve learned that in order for me to get anything done, I need a large legal pad filled with thin yellow pages and thick lines, which are suitable for only fitting ten or so tasks to list under “To-Do!” I guess I’m old-fashioned in the sense that I need to have my tasks at hand,literally in front of me. On paper. If it’s on the computer, things don’t end up working out very smoothly. Now, I know, this is coming from a 19-year-old– one who you’d suspect is constantly texting, watching television, and socializing on the telephone until two o’ clock in the morning. I am the worst when it comes to texting, as a matter of fact, my mother can send a text message faster than I. If you’ve ever gotten a text message from me, you’ll know that I am not educated when it comes to texting lingo. “FTW?! What is that supposed to mean?” I’ll admit, I still feel uncomfortable writing “FTW”, as I’m sure, knowing my luck, I’d type it into my phone incorrectly. As for watching television and socializing on the telephone until two-in-the-morning? Well, I’d much rather get in a couple hours more sleep, to be completely honest. I’ve also learned that the longer I put something off, the tougher it is to begin. Like this post, for instance. After over two months of not posting, and realizing that enough was enough, the other night, I felt like I had to make up for that lost time. And I’m not sure if I will with a single post (if I have managed to do so, I thank you for thinking so). With each post on the site, I found that I was slowly pulling myself back, and it’s scary to say such a thing, but that was the case until I sat down to write this post. I pulled myself back, for the fear that I’ll have nothing left to write about, or that my photos or my prose will be nothing as great as my last one. But a friend reminded me that I started this blog for myself, and that I must continue to write for myself- whenever I have time to write. It seems sort of selfish to think that way, but I think putting myself in that mindset is the only way that I’ll be able to share more with you. She also reminded me that “Good writing comes from living.” So, I will do just that– live. A regular schedule of posting would be nice for all of us, and I assure, you, with all my might and will-power, I will try to do just that. So, without biting-off more than I can chew, let’s start off with once a week, shall we? And if I have more time and more to share, there might be a couple posts a week. I feel that putting it in writing makes it more solid, and sharing it with friends almost forces me to stick with it (“Force” isn’t quite the word… I’m leaning more toward “encourage”, but I’m sure you get my drift). In addition to coding and re-working the site layout, I’ve been baking more than ever. Now, the site clearly doesn’t show that, but I assure you, I have. If you remember the news in this post, I have more exciting news to share with you. I hate dancing around the topic at hand, and I’ve a very bad tendency to do so, as being the center of attention just isn’t my thing. I’d much rather be giving others attention, than receiving all of it. The publishing company I was developing a proposal with a while back? It was Chronicle Books in California. You might have quite a few of their books on your bookshelves or in your kitchen, in fact (Among a few: Plenty, Tartine, Tartine Bread, Ruhlman’s Twenty, Sky High, and Flour). We’re calling the book Hand Made. As time draws closer to publication, of course there will be so much more information about the book to share with you, but for now, I know this much: there will be chocolate, and with each post, there’ll definitely be talk of Hand Made. Speaking of chocolate, as you’ve probably noticed, I made us some insanely rich and moist chocolate cupcakes in honor of all of this news, and because I wanted to make it up to you, my dear readers. 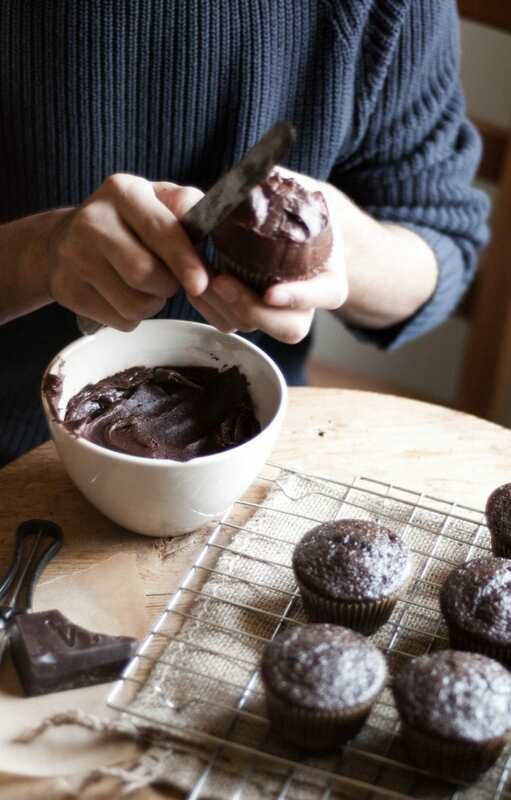 This chocolate cupcakes recipe is as difficult as putting a boxed cake mix together. It all starts off with a scant cupful of all-purpose flour, a cup of sugar, a kiss of cocoa, a touch of baking soda and baking powder, and some sea salt in a large mixing bowl. The dry mixture is whisked together, just until the cocoa turns the pale ingredients into a milk chocolate tan. After that, vanilla extract, an egg, some sour cream, vegetable oil, and a bit of boiling water are stirred in until just combined. 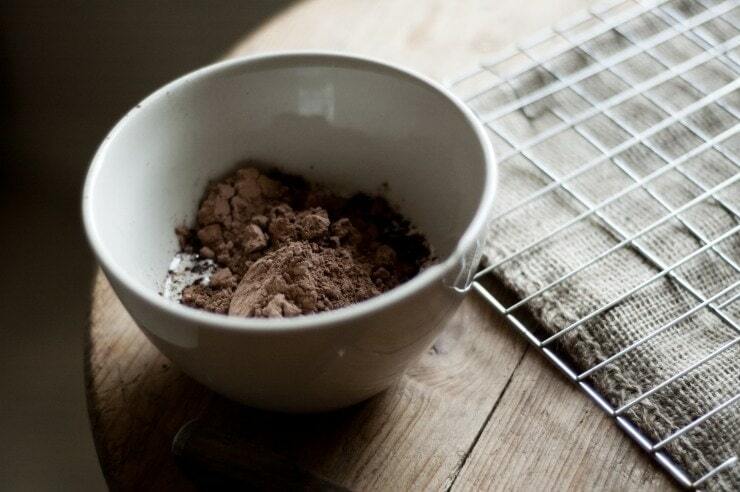 The watery chocolate mixture is spooned into a paper-lined muffin tin, and is then baked for about 17 minutes. In that time, the liquid chocolate concoction transforms into tender, moist-crumbed chocolate cupcakes. Once baked, the chocolate cupcakes are left to sit in the tin until the tin is cool to the touch, then they’re transferred to cooling racks while the frosting is made. The frosting for this chocolate cupcakes recipe is as scarcely difficult as the cake- it requires a mound of cocoa and a small puddle of melted butter to be combined in a bowl with a couple heaping cupfuls of powdered sugar, some milk, and a scant teaspoon of vanilla extract. The mixture is mixed until smooth and spreadable. Once the chocolate cupcakes have been completely cooled, the dulcet dark earth-colored frosting is generously spread onto each cupcake. 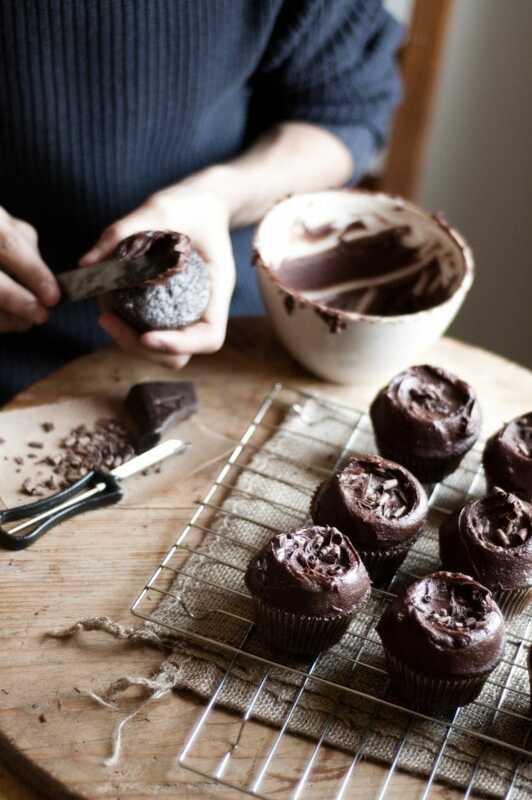 Once finished, each cupcake is adorned with fairy dust, in the form of dark chocolate shavings. And there you have it! Hand Made by Kamran Siddiqi. 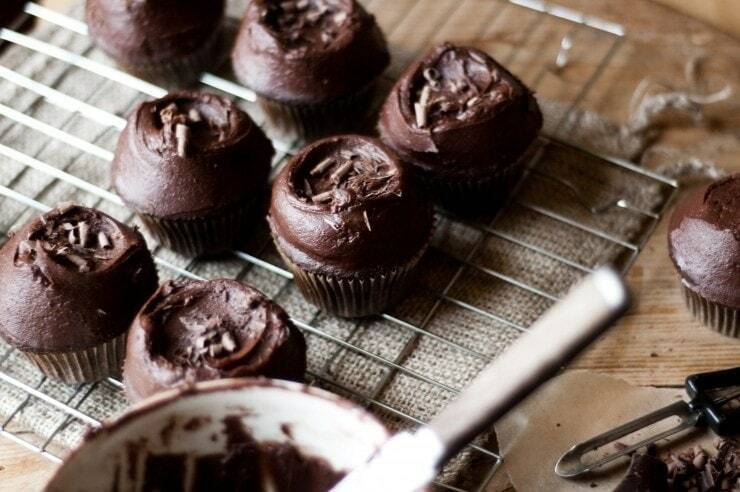 Chocolate Cupcakes. Yes. These cupcakes are as difficult as putting a boxed cake mix together. Because I find every excuse possible to not dirty another bowl or spoon when baking, I’m happy to say that this recipe doesn’t require much to be dirtied. It’s a one-bowl recipe that can be made, simply, with a bowl and a spoon / silicone spatula. It can also be made using a stand mixer (which in this case, I find to be a bit more work), or a food processor. If you do plan to make this recipe at the last minute, and you don’t have time to bring an egg and the sour cream to room temperature simply place it in a glass of hot (not boiling) water for a few minutes; doing so will take the chill off and bring the egg to room temperature. As for the sour cream, running it in the microwave for 10 seconds or so should do the trick. When filling the cupcake liners, be sure to fill them up with no more than 3 level tablespoons of batter, as this batter is quite runny, and doesn’t dome over when it rises like a muffin would, instead it spreads out, and if there’s too much batter in one of the cups, the batter will spill-over the liner and onto the pan. I have gotten away with making 12 cupcakes instead of 16 cupcakes with this recipe, but a few cupcakes did manage to spill-over, and I couldn’t have that happen to you! I prefer to use a 1.5 ounce ice cream scoop for this task, as I know that each cup will be filled with the same amount of batter, and that all of the cakes will cook at the same time. 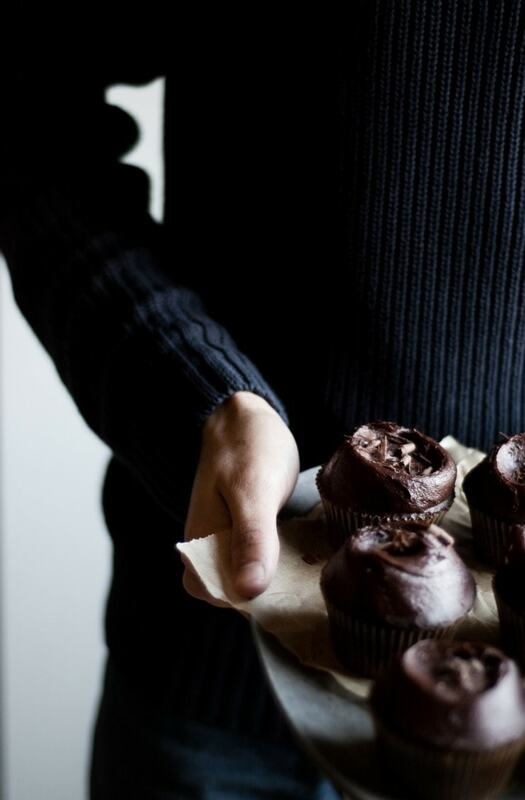 Do note that the frosting recipe provided can easily frost all 16 cupcakes, however, if you’d prefer to have tall “hats” of chocolate frosting on each of your cupcakes, as pictured in this post, 1 ½-ing the recipe will be necessary. Preheat the oven to 350ºF/ 180ºC / Gas Mark 4. Line standard muffin tins with paper liners. Now, in a large heatproof mixing bowl, whisk together the granulated sugar, all-purpose flour, cocoa powder, baking powder, baking soda, and salt. Crack in the egg, spoon in the sour cream, and pour in the oil and the vanilla. Mix with a wooden spoon or silicon spatula (which I prefer) just until smooth and combined. Pour in the boiling water, and slowly mix starting from the center working your way out (this makes it easier to mix without the splattering.). The batter will be liquidy, but fear not, this is normal. Divide the batter evenly among the lined cups, using a spatula to help you scrape the bowl, filling each lined cup with 3 tablespoons of batter, about halfway full. (Kamran Note: I use a 1 ½ ounce ice cream scoop for this, which makes things a little easier when it comes to filling). Bake for 15-19 minutes, rotating the pans halfway through, until a cake tester or a wooden toothpick inserted into the center of each cupcake comes out clean. Transfer cupcakes in pans to wire racks for about 10-minutes until the tins are cool to the touch. Once the tins are cool, remove the cupcakes from the pans, and transfer to the wire racks. Let the cupcakes cool completely before frosting. 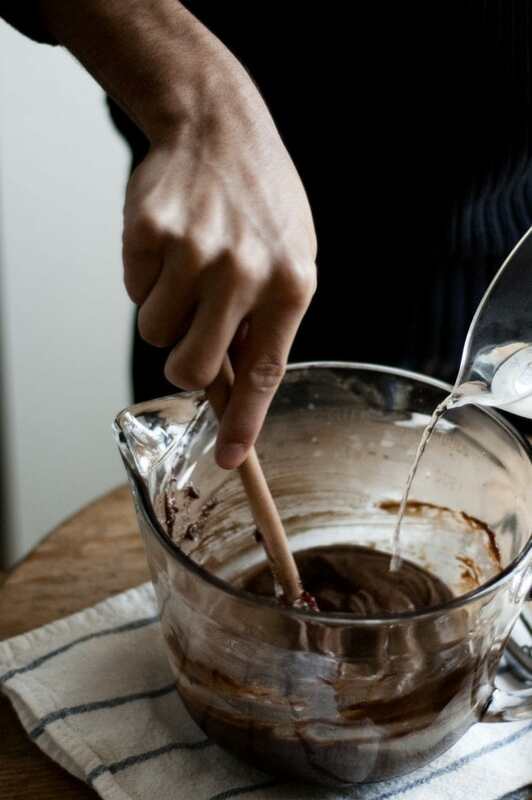 In a large bowl (or in a stand mixer), combine the melted butter and cocoa powder powder until smooth. Now, alternately mix in the milk and powdered sugar, beating (on medium speed) to spreading consistency. Add another tablespoon or so of milk, if necessary. Mix in vanilla and golden syrup / light corn syrup. Frost the chocolate cupcakes using a small offset spatula or non-serrated butter knife, making sure to frost to the very edges (doing this is not only an excuse to have more frosting on your cupcakes–yum!, but it also helps keep the cupcakes moist), and adorn with chocolate shavings or other edible decorations of your liking. Note on frosting the cupcakes: To frost the cupcakes, I used a small off-set spatula (you can use a butter knife without a serrated edge, if you don’t have one) at an angle to spread the frosting smoothly around the cake. Then, I used a cake spatula to create the indent in the center. Turn 360º one way, and turn 180º in the opposite direction; lift the spatula, and that’s it. Shave some dark chocolate on top using a vegetable peeler (or you can use a microplane or one of those manual cheese graters that they use at Italian restaurants to grate parmesan), and you’re done. It’s lovely to see you posting again! It’s easy to get bowed by the pressure of success or good news- like writing an awesome book! – and feeling like you have to one-up yourself again, and make something even better. I’m not usually a cupcake person at all but these look delicious. I particularly like the photo of the cocoa mix in the bowl of the edge of the table – the light and the curves are beautiful. Wonderful news! Great to see you back at blogging as well. I have always enjoyed your honest writing and delicious recipes. Good luck with your new venture. Glad you’re back, and congrats on hand made! 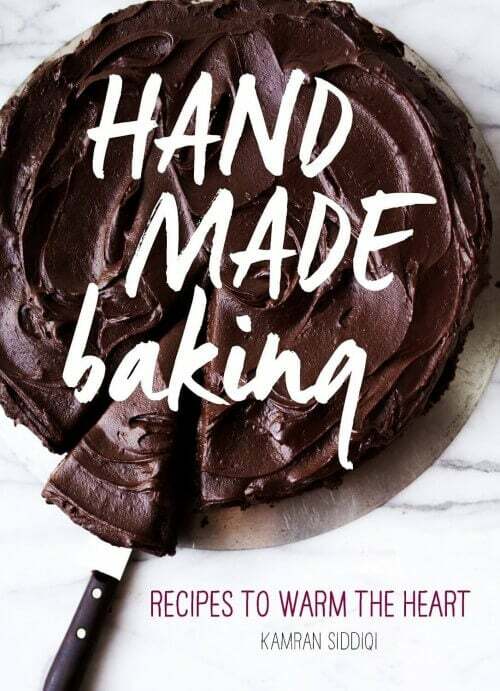 I love reading your blog and I am too thrilled about “Hand Made” although I think it should be “Kam Made”. Keep being an fantastic inspiration for everyone, especially people your age!!! YOU ROCK!!! Welcome back and congrats on the book. We made chocolate cupcakes last night but they didn’t come out NEARLY as pretty as these. Bookmarking this recipe to try next time. Kamran, I love your site I am so inspired by your voice and your recipes and beautiful food and photography. I understand about learning how to balance and sometimes think people get caught up in posting and blogging and the pressure of it all. Take your time to figure out your balance and we are all cheering you on! Wonderful, just wonderful news about the cookbook, applause well deserved and I look forward to seeing it! Thanks once again for yet another wonderful blog. You should definitely keep writing for YOU and no one else. But it’s awfully nice of you to share it with us =). Enjoy the publishing journey! Best wishes! So glad you’re back! And I love your writing. You make everything seem so clear and beautiful. So true about things getting harder the longer you let them sit. Thank you for the encouragement! So much to be excited for. Your world is changing, in such wonderful ways. Congrats my friend! Yay!! Such happy news, and such delicious-looking chocolate cupcakes indeed! A book involving chocolate and Kamran… sounds perfectly matched. As do these cupcakes! 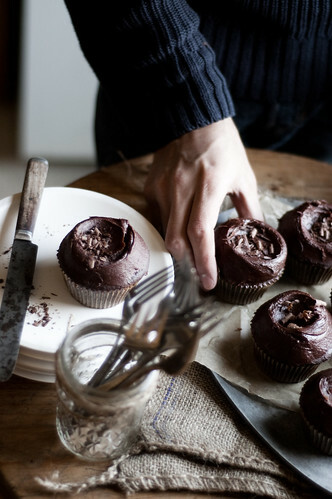 I love that there’s a rustic-ness to the shots, but the cupcakes and frosting themselves are quite dark and elegant. Congrats again hun. Couldn’t be happier. As for the writing.. of course we all missed your posts but be sure to take care of yourself first and foremost. The blog should be a release to outside pressure.. not a cause for it. Ok? Hug. Love the style of pics. You don’t over crowd your pics with props that are not related. Luv that! Congrats on the book deal, you truely deserve it!! So glad to see you back online, Kamran! And what wonderful news. Congratulations to you!! Congrats Kamran!! So happy and excited for you & Hand Made :) Don’t worry about posting, we all are here to support you! I am not even a sugar junky but they look divine, handsome cakes. WOW. Stunning shots as well. So very excited for you, Kamran, and happy you’re peeking your head out to say hello. Congratulations on Hand Made! How very exciting. And, I’m definitely looking forward to more frequent posts! Glad to see you posting and hooray for all the news!! So happy for you!!! Congratulations, Kamran! I’m looking forward to seeing Hand Made and even happier to see you blogging again. Awesome Kamran. Can’t wait. The cupcakes look divine too. That’s wonderful news – Congrats! I am so happy for you Kamran!. 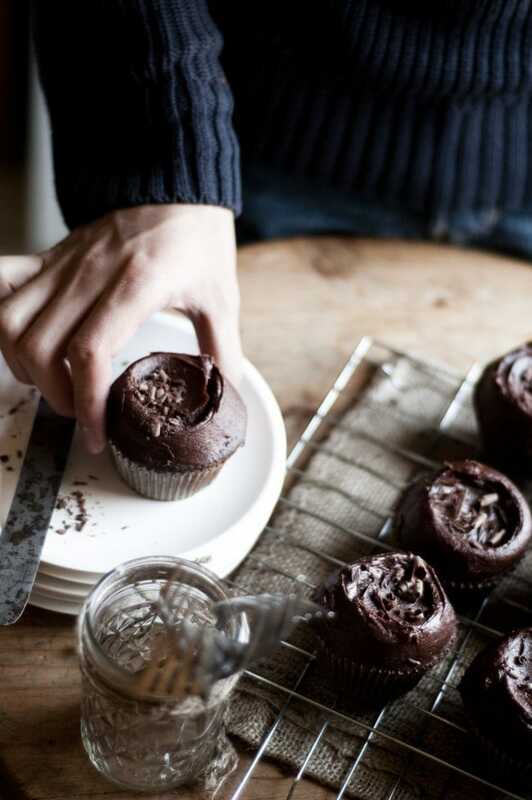 what a wonderful news, I will be looking forward to `Hand Made´ and in the meanwhile I think I will prepare a batch of this delicious chocolate cupcakes, they look fantastic. Photography is just beautiful, evocative and so poetic. It’s so nice to finally read a new blog post. Congratulations! Love the visual recipe index. Can’t wait for the book. And I think the Flickr group is a wonderful idea. Amazing news about the book! These cupcakes look incredible. If not for the two chocolate cakes I already have in my kitchen, I’d be really tempted to dive back in there and bake them immediately. I’m the same way with lists, putting it on paper makes the task more real somehow. Congratulations, Kamran! Well deserved news and a beautiful site, of course. Woot! Welcome back! Congratulations on the book! I can’t wait to see it. So much love to you. Oh, and the site and the cupcakes both look gorgeous. I have only just discovered your blog thanks to Fork Magazine. I’m delighted that you’ve decided to blog again as I’m sure I’ll enjoy both your prose and pictures. I’ve wondered where you’ve been. I like the scoop out of the frosting in these cupcakes. Takes the chocolate cake to a new individual touch level, while keeping it sophisticated and approachable. The best thing I’m reading about you is that you are finding you. Never let trends define you. I’ve talked to other bloggers about the mass marketing approach out there, teaching people to make cookies from cake boxes and they want to copy it because it sells. But, it sells people short too and to me not worth any success at all. Homemade is the ONLY way to go. And, I for one, would never encourage women to continue buying and eating junk just to get better blog traffic. You at your young age seem to get this. Bravo for that. Angela, your comments are always so thoughtful! Thank you for your kind words and honesty! I, like you, firmly believe that handmade is the way to go. I would never- not even for more traffic, money, fame, etc. would insist that people eat junk laden with unpronounceable ingredients. To me, I don’t care how cute or pretty something is, I’d much rather have it be made from scratch with REAL ingredients, rather than boxed and canned junk. I’d gladly pay $5 for a handmade cupcake than $1 for two or three box and canned-made cupcakes. At the end of the day, I prefer to be healthy than wealthy. Box/can-made things are, to me, a tacky and unhealthful trend. I know some will disagree with that; everyone’s entitled to their opinion, however, this is what I believe. I don’t want to be the cause of people getting sick because they made one of my recipes and it called for ingredients that could ruin one’s health. I wouldn’t be able to sleep at night if I did such a thing. You are such an inspiration, Kamran. And congratulations! 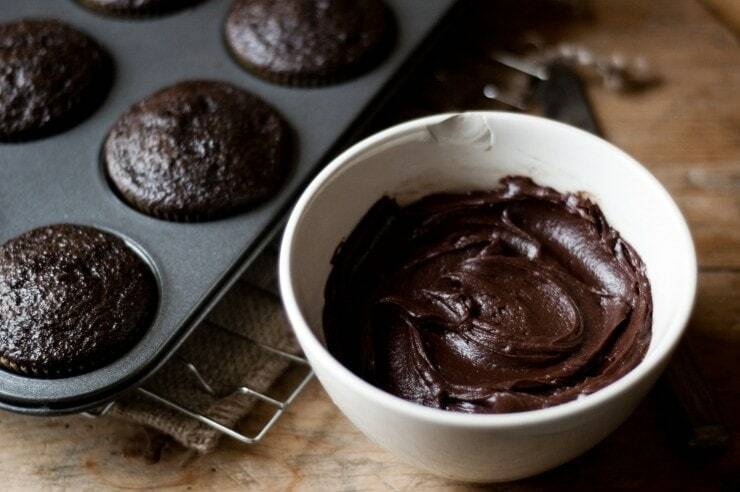 Those look like the best chocolate cupcakes ever. And that frosting…oh my goodness it looks divine! I’m not even sure how I found this blog, but all of a sudden the cupcake pictures were on my screen. I made these today..and I’m eating them now..and I’m glad no one can see me because I have frosting on my face and I’m getting crumbs all over my desk. These are so easy to make and delicious!!! Congratulations!!! This is a great news and I’m super happy for you! Your blog is magic, you have such a polite and dreamy voice! Happy happy…Can’t wait to read it! The only problem I had was that after I baked them, they got flat again, even though the rose during baking. What could be the problem? Gosh you’re only 19! Tell me where and how you learned the “chemistry” of baking. I would like to learn how to change a recipe but I don’t know the chemistry involved. Cookbook? On-line? Trial and error? Once I know basics, I won’t be opposed to some trial and error but right now I just don’t get it. Delighted to have found my way here, and to see such wonderful words and photos and recipe, and to think, “I want More!” and to read that you are working on a book. Hooray for you, congratulations, saving space on my shelf. Love how you describe the process, so inviting. Glad you’re back! I still can’t believe the news about your book deal; that’s amazing. These cupcakes look delicious, totally worthy of celebrating “Hand Made”. ummm yum! I’m making these this weekend. Congratulations! Congratulations on your book with Chronicle Books. I’m sure it will be a success. And so glad to see you posting. Wow, Chronicle!! Congrats Kamran!! And these chocolate cupcakes? FAB!! They remind me of closed sea anemones out in Tofino. Hello Kam! I have just found your site today and I’ve looked through every single page (I cannot believe your 19). WOW! Your work is beautiful! Your writing makes me want to read your posts all day and I wish I could take all of your photos and frame them throughout my house. Congradulations on the book deal! HandMade will have a place in my kitchen when it comes out. It will be BEAUTIFUL like all of your stuff! One more thing: I’m very curious about how you frosted your cupcakes. Can you tell us how you did it? To frost the cupcakes, I used a small off-set spatula (can use a butter knife without a serrated edge, as pictured above) at an angle to spread the frosting smoothly around the cake. Then, I used a cake spatula to create the indent in the center. Turn 360º one way, and turn 180º in the opposite direction; lift the spatula, and that’s it. Shave some dark chocolate on top using a vegetable peeler (or you can use a microplane or one of those manual cheese graters that they use at Italian Restaurants to grate parmesan), and you’re done. Oh my. Wow. I am so very happy I’ve found your blog, it is indeed a treasure. Even though I am a first-time reader I want to congratulate you and thank you for being so awesome. I will most certainly come back for more and try your recipes as soon as possible. Reading this just makes me think of where I was in my life when I was 19 – honestly, I was just all over the place, wanting to catch myself and learn it all. I’m 25 now and I’m beginning to think that this whole process of “knowing thyself” is an everlasting one. Your work is honest and original, you seem to be “keepin’ it real” and for an outsider like myself it seems you have a really good sense of what you like and what you want. Just keep going! I absolutely adore how you frosted these! Welcome Back Kamran! 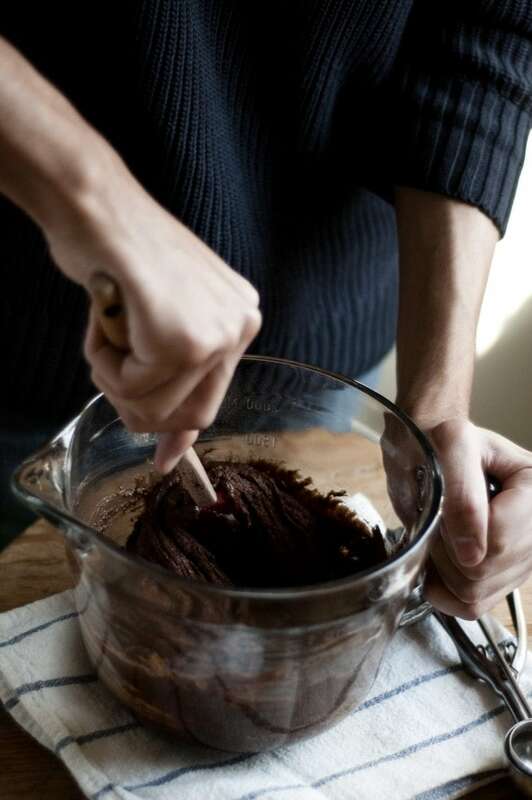 :) Love this chocolate frosting recipe! It looks yummy! Kamran, while you do not know me, nor I you, it is a pleasure to “meet” you. I discovered tsg this afternoon while in search for a birthday cake I’d like to make myself for this weekend. The chocolate strawberry won me over. This site is lovely, as are your creations and how you display them. This cupcakes were delicious! They were so easy to make, and the frosting really reminded me of Magnolia Bakery’s frosting in New York – something I have been looking for a in a homemade recipe! Thanks so much! Glad to see you back in the saddle. I am excited for your book. I am definitely going to make these the next time a chocolate cupcake pang hits. Your wisdom and perspective far surpass your youth. Looking forward to more from you! Hi Kam, thanks for the recipe and the lovely photos! I made the recipe last night as mini loaves, they turned out very moist :-) I will definitely look for your book. In the same time, please keep posting – love to see more of the insights! Hi Sunny, I’m so glad you liked the cupcakes! I might be wrong, as I’ve not made this frosting in a while, I suspect you might be putting too much confectioner’s sugar into your measuring cup. I find that spooning the powdered sugar into the measuring cup just until it’s overflowing, and then sweeping a flat utensil over the top (such as a butter knife), is ideal. It doesn’t pack in the powdered sugar… Now, if you’ve a scale, I suggest weighing the powdered sugar out. It saves the hassle and mess of scooping and sweeping! The golden syrup / corn syrup in the recipe allows the frosting to be nice and smooth, and easy to spread onto the cupcakes. It gives the frosting a better mouth feel, as well. It’s not entirely necessary in the recipe, but I do recommend using it. Hi Elisa! It’s a 2 quart batter bowl made by Anchor Hocking. If I remember correctly, I picked it up at the K-Mart in Penn Station a while back for something like $8. The cupcakes are amazing and so good!! Thanks for the recipe!! Congrats on your exciting news! You have a lovely blog and I am sure your book will be just as brilliant. This recipe is making my mouth water! Have a great upcoming holiday weekend! These were delicious — moist, rich and so full of chocolate flavor. Kam, love your blog. I’ve made two things from it TODAY right after I found it. Made these cupcakes with dark chocolate cocoa instead of regular. AMAZING results. I did have a hard time making my frosting stiff enough, but that might be because of the humidity where I am. Still turned out great, just more of a ganache instead of a frosting. Anyway, I am going to go back to destroying my health with cupcakes…. love your comment about lined paper. I have the same problem. Can’t wait to try the cupcakes. Thank you, thank you, thank you !!!! This is THE recepie that I was looking for !!! I`ll keep following you from now on !! These look wonderful! If I may ask, what brand of cocoa powder do you use? I wanted to say these are the best ever! I am so glad I tried this recipe. The photos definitely do the recipe justice. Thank you for sharing this lovely recipe. These are wonderful! The cupcake and the frosting are just delicious–I sprinkled a little sea salt on some of them and that was heavenly. So glad I found this recipe! I baked these last Friday morning, and everyonw went crazy! I loved this recipe! Hello! I just made these today for my 18th birthday and absolutely loved it! 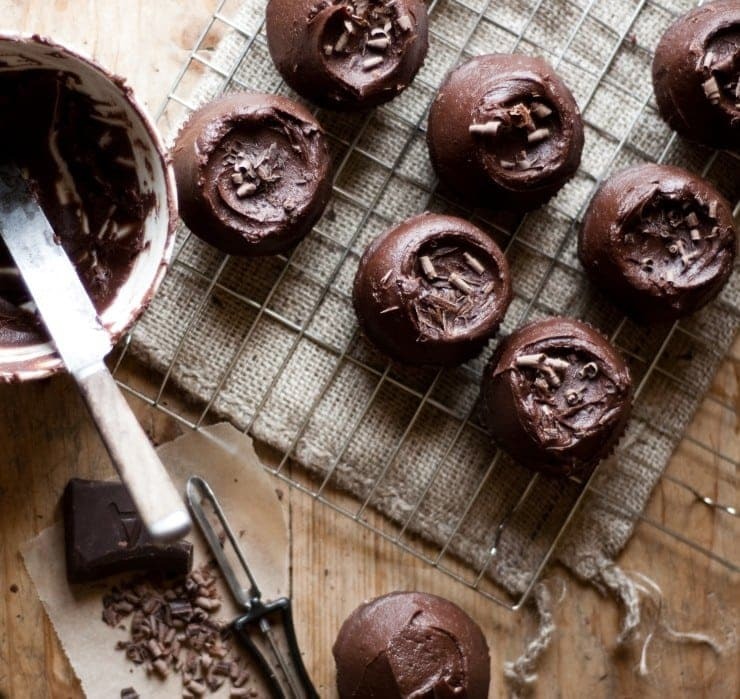 I have tried a myriad chocolate cupcake recipes and this one takes the cake! Will deffinately be my go-to recipe from now on. It is so moist and fluffy, the first cupcake that was just the right amount of dense but airy and the perfect amount of sweetness! Love love love! Thank you for sharing this, I will deffinately be using this recipe for years to come! This recipe was so amazing that I had to make it twice this week. Super moist, unbelievably easy to make. Thank you so much!!! Beautiful photos, I wonder which camera and lens you are using? Hello! I just found you through Pinterest, and wanted to say that these cupcakes were amazing! I just finished baking a batch for a party tomorrow, and am over the moon with the outcome. And your photos are beautiful! Hello! This is such an amazing recipe and I’ve used it about 5 times in the last month! One problem I keep encountering is that the cupcakes will not fully peel off the liners; little its will still stick to the cupcake liners. Any suggestions as to what may have gone wrong? A toothpick inserted came out clean, and I am using the Wilton brand liners. Nonetheless, this is a very delicious recipe! Just made these 2 hours ago and LOVED them! Thx. I’m sure your book will be superior! I have the Tartine Cookbook and the pictures and recipes are amazing! I know your book will be too! Looking forward to it! I live in Asia, but I need to get my hands on that book of yours if its already released! More power! These cupcakes turned out to be very soft, moist and slightly chewy which I loved. Its also very chocolaty which is another think I loved about this yet it wasn’t too sweet or too bitter. Icing is very nice and adds that touch to the cupcake. I found the icing to be a bit runny, I guess I over beat it but it did spread well. Thanks for the recipe. I just made these. So delicious! I added too much milk and consequently needed more powdered sugar, so now I have a lot of leftover frosting. It tastes so good alone that I don’t mind :) I also didn’t have any sour cream and substituted Greek yogurt, which worked really well (if anyone else was wondering). Made these yesterday and they are DELICIOUS!! I love to baking but some recipes are so “involved!” This was easy peasy and a hit with my family. Thanks for sharing. http://www.inspiredbybeatriceclay.com. These cupcakes were amazing! I made these into mini cupcakes for a party and everyone loved them! I was wondering if this recipe can be made into a cake. I hope so because this is my go to recipe from here on out! Thanks for posting it!! Just thought I’d stop by to say that these cupcakes are my go to chocolate cupcake recipe! (Icing as well) Very easy to make and soooo tasty. The liquid batter makes for the most moist cupcake youll ever have and the icing is a one bowl process that ends up a perfect chocolately buttercream that requires no chopped chocolate (I hate that part!) Softest cupcakes I’ve ever made and I’m in love! These would go so well with any combination of icings. MUST TRY! I just made these cupcakes–they are beyond delicious!!! Thank you! Can I use olive oil in place of sunflower oil? I just made them today – easy recipe, takes no time, but the best thing is that they are absolutely delicious!!! thanks! I have six daughters, some love chocolate, some don’t. I LOVE to bake. 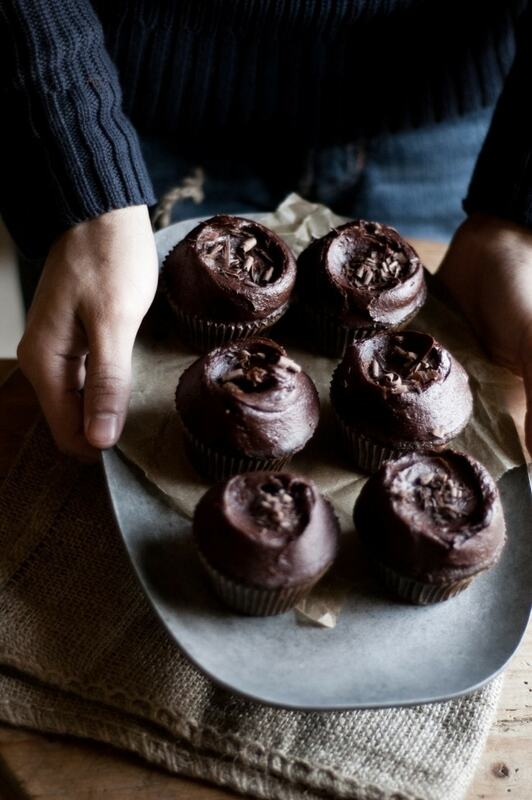 We made these cupcakes and they were the perfect mix of chocolate & sweet. The texture of the cake was light but perfectly balanced with the Chocolate. The girls loved them so much we are making them for Grandpa’s 88th birthday with a dollop of German Chocolate Frosting in the middle. Your writing is beautiful. My Oldest daughter is 22, my youngest 8. Life can throw lemons but getting up each day and making lemon aid, truly makes you feel better. I have seen a lot of high’s and lows over the years, friendship & Love keep us going. Have a wonderful day. Thank you for sharing your talent! Best chocolate cupcakes and frosting I’ve ever made or tasted. Only thing I added was a bit of salt to the frosting. Outstanding!! Thanks! I’m eating one of these as we speak. I used Dark Chocolate Cocoa instead of regular and plain old canola for the oil and they’re just fabulous. Incredibly rich and moist. Thank you so much for sharing. I just stumbled upon the digital food awards article in F&W and found your blog. I love your honest writing and beautiful pics. I look forward to your new book Hand Made. Well Done! Hi, I’ve made this a lot and always turned out really well, even if I used yogurt instead of sour cream. Do you think I can use the same recipe to make a red velvet cupcake by decreasing the amount of cocoa and adding red food color? I’m planning to make this and red velvet cupcakes for my nephew’s birthday next month. Yum! I made these tonight for some friends and they were so good and EASY! One bowl? Yes please! I made these cupcakes for my sisters wedding this weekend and they were perfect! She really wanted regular buttercream frosting, so I did not actually make the frosting listed here…but the cupcake was excellent! I can’t tell you how many different chocolate cupcakes I’ve made in my lifetime, but from now on these are the only ones I will ever make. They are the best chocolate cupcakes ever. Thanks so much for this recipe! Congratulations!! Can’t wait for Hand Made, I’m sure it will be stunning. These cupcakes are beautiful photographed and sound phenomenal, lovely! Pinned! But then and not too sure what went wrong with thr frosting. I did melt the butter and so on ., but it turn out like splitting. The chocolate is not combining on the bottom, but the taste is so good im still going to used it. A delicious recipe for Indian peas pulao.